VAILLANT DE GUESLIS, FRANÇOIS, priest, Jesuit, missionary; b. 20 July 1646 at Orléans, France; d. 24 Sept. 1718 at Moulins. François Vaillant de Gueslis entered the noviciate of Paris on 10 Nov. 1665 and studied philosophy; he began his theology at La Flèche in 1667. He sailed for Quebec in 1670 without finishing his studies and taught junior classes in the college there, preparing himself at the same time for the priesthood, which was conferred on him by Bishop Laval on 1 Dec. 1675. He was first a missionary at Lorette under the guidance of Father Chaumonot*, and left two relations of that mission, for the years 1675 and 1676. In 1678 he went to the Mohawk country to be an assistant to Father Jacques de Lamberville. 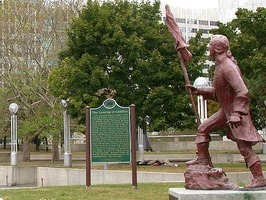 He had been alone there since 1682 when the war with the Iroquois forced him to return to Quebec in 1685. In 1686 he became church prefect at the college, and in 1687 minister and at the same time procurator of the mission. He accompanied Brisay de Denonville on his expedition against the Senecas, and on 19 July 1687 set his hand to the act taking over their country. On 31 December 1687 he went as an ambassador to Thomas Dongan, the governor of New York, to try to persuade him to promote peace between the French and the Iroquois. 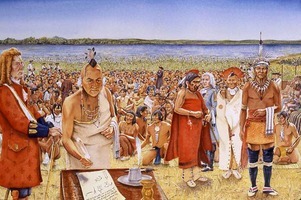 The demands which Dongan put in the form of an ultimatum on this occasion only made more difficult the negotiations which were underway between the French and the Iroquois, and which failed completely through the fault of the Huron chief, Kondiaronk. In 1693 Vaillant went to found a residence for the Jesuits at Montreal, and as soon as he arrived he established a community of men. This superiorship ended in 1697. After this he was again appointed procurator at Quebec, where he remained until 1701, when he was sent to set up the Indian mission at Detroit. The hostility of Lamothe Cadillac [Laumet] forced him to return a few months later. 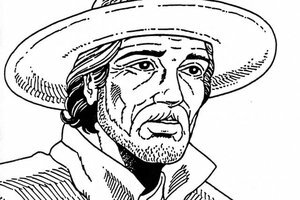 In August 1702 he set off again, with Father Julien Garnier, to found a mission among the Senecas. He came back to Montreal in 1706 to assume once more the office of superior, but illness obliged him to give up this position in 1716. After another year spent in Montreal, he had to sail back to France, where he ended his days. ASJCF. Rochemonteix, Les Jésuites et la N.-F. au XVIIe siècle, I, 99; II, 413; III, 204–8. Lucien Campeau, “VAILLANT DE GUESLIS, FRANÇOIS,” in Dictionary of Canadian Biography, vol. 2, University of Toronto/Université Laval, 2003–, accessed April 22, 2019, http://www.biographi.ca/en/bio/vaillant_de_gueslis_francois_2E.html.